Take to the roads with the confidence that you have the best team of motorcycle accident lawyers on your side to represent your issues when you need them most. Whether we are protecting a downed rider’s rights and finances through aggressive representation of a personal injury case, maximizing the value of recovery for a wrecked bike or helping a rider deal with legal matters stemming from a ride gone bad, the lawyers at SteelHorse Law are committed to nothing less than tenacious representation of bikers from all walks of life. Contact us for a free accident evaluation and consultation or come by our offices. We are located in Georgia, Tennessee, and South Carolina. If you were involved in a motorcycle accident and you have questions or you would like one of our attorneys to assist you in evaluating it, feel free to contact us at 1-888-38-COURT or fill out the information below. Were you or the other person cited with a traffic violation? Did the other party of insurance, and if so, which company? Are you uninsured or under insured? Did the other person leave the scene? 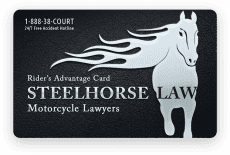 SteelHorse Law has put together our Rider’s Advantage Card so you can take advantage of the protections we offer for free. As we expand the program you will be made aware of the new advantages available to you. Free Legal Advice for All Motorcycle Related Matters. Free Representation for Motorcycle Damage Claims. "There's a lot of boneheads that can cause you to lay your bike down. SteelHorse Law can help."